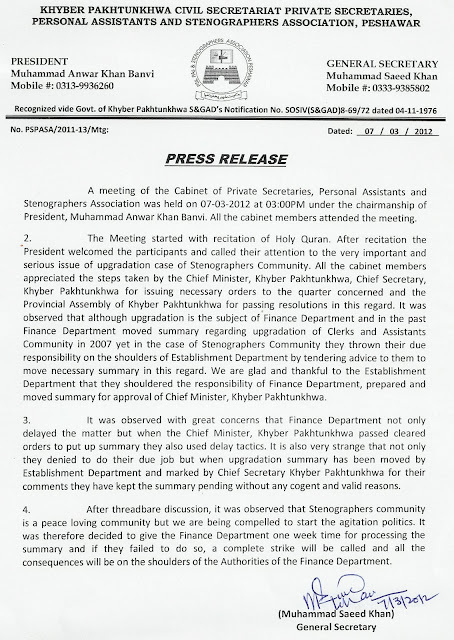 All Steno/PA/PS/PSO working with Chief Ministers of their Province, Principal Secretary to Chief Ministers, Chief Minister's Secretariat, Ministers, Chief Secretary, Add. Chief Secretary, Secretary Services, Finance Secretary and at Civil Secretariat are suggested to request their Boss for upgradation of the posts of Stenographers/PSs without further delay and also meet to your concerned MPA/Politician to do political pressure to Chief Secretary/Addl. Chief Secretary/Finance Secretary for putting up positive summary for onward submission to Chief Minister for implementation of Supreme Court Judgment dated 11.10.2011 and Finance Division Notification dated 23.12.2011. Further, also use press media both print and electric. I appreciate to M/s Muhammad Anwar Khan Banvi, President and Muhammad Saeed Khan, General Secretary of Khyber Pakhtunkhawan Stenographers Association for giving one week ultimatum for putting up of summary to Chief Minister KPK. This is the better way to putting up pressure to Finance Secretary. I also request the Stenographers Association of Punjab for hosting meeting and give ultimatum to Chief Secretary & Finance Secretary. 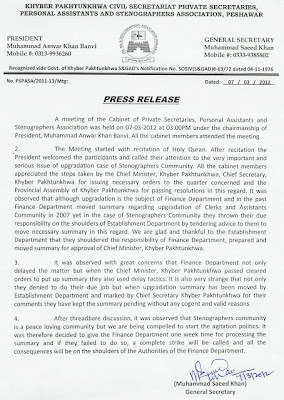 it is hope that the authorities of finance department KPK,will be considerd the matter within stipulated time which has been given by the Civil Secretariat Association KPK,to avoid the call of strike thread and for smooth running of the office routine work in the concerned offices wherein working aggrieved employees and oblige.Thanks.